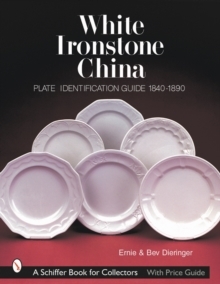 The identification of English white ironstone plates is made far easier through this new book. Organized according to the shape names, the 327 color photographs and 252 drawings of plates, rims, potters' marks and registry marks are easy to compare. Copper Lustre and Tea Leaf decorations are included. Because few written records from the manufacturers are available to help analyze these plates, made in large quantities for export primarily to the United States between about 1840 and 1890, this study will be an important reference for identification and comparisons. It is both comprehensive and easy to use, providing an important tool for collectors, dealers, curators, designers, auctioneers, and historians for analyzing Victorian cultural history.